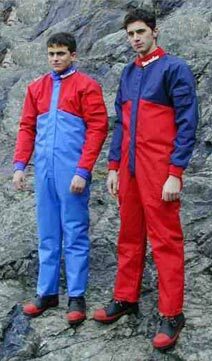 Warmbac oversuits are known by cavers around the world as a quality product. Trusted by experienced cavers and outdoor centres alike they are as tough as they come. This is the hard wearing work horse of the Warmbac range. This oversuit is trusted by cavers and potholers everywhere. Made from 9oz/1000 denier Cordura. This oversuit has only 4 main panels for maximum strength. Main features include detachable hood, neoprene cuffs and adjustable collar, 2 way heavy duty zip with velcroed flap, one internal pocket and one on the left sleeve. For extra protection against abrasion. The lower back seam is protected by a strip neoprene enclosed in a cordura tube. All seams are stitched 5 thread over locking with 7 thread reinforcing for the crotch. To avoid abrasions the lower back seam is reinforced with 25ml webbing. We offer a choice of zip or 50mm Velcro for the front closure.